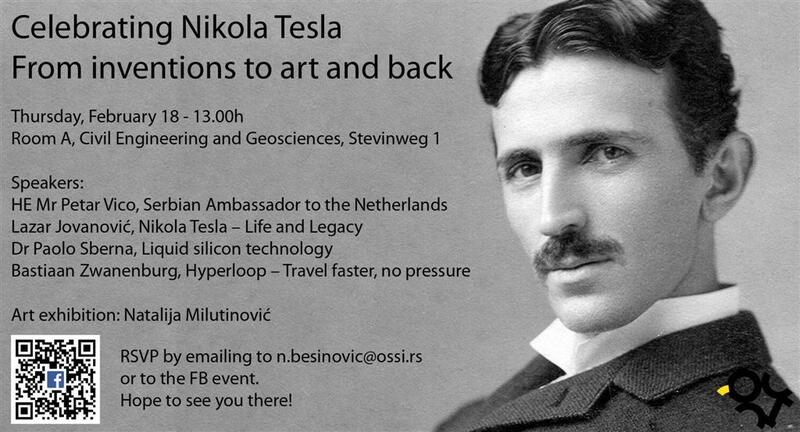 The lecture dedicated to the great Serbian scientist Nikola Tesla "Celebrating Nikola Tesla - from inventions to arts and back" was held at the Faculty of Civil Engineering and Geosciences in Delft on February 18, 2016. The list of speakers included H.E. Mr. Petar Vico, Ambassador of the Republic of Serbia in the Netherlands, Lazar Jovanović (Nikola Tesla – Life and Legacy), Dr Paolo Sberna (Liquid silicon technology) and Bastiaan Zwanenburg (Hyperloop – Travel faster, no pressure).